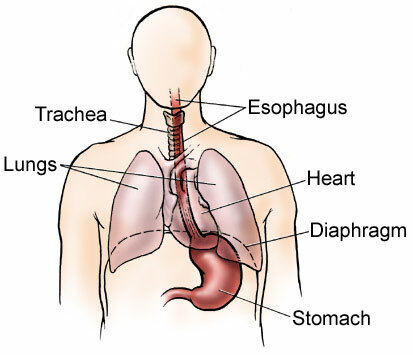 The esophagus is an organ that consists of a muscular tube where food passes from the pharynx to the stomach. Its function is very important in human digestion as it carries liquid, foods and even saliva from the mouth to the stomach. Once food and liquids reach the stomach, it then acts to start digesting then proceeds to pump the food and liquids to other intestines so that it is properly digested over time. Once the food is digested, other intestines absorb the nutrients from the food. The mucusa or mucus serves as a protective shield that helps aid large quantities of food, saliva and mucus to be properly digested in the stomach. Lamina propria lines the tubes in the body such as the gastrointestinal tract, the urogenital tract and the respiratory tract. It is chiefly responsible for the production of mucus and serous secretions. Muscularis muscusae, a thin layer of smooth muscle found in the esophagus that is responsible for the expulsion of the contents of glandular crypts as well as the enhancement of the contact between the epithelium and the contents of the lumen. Submucosa, which contains the esophageal glands or secreting glands that supports the mucusa and combines the mucosa to the smooth muscle. Muscularis externa, which is responsible for the control of swallowing in the upper and lower potions of the esophagus. The adventitia is the outermost connective tissue of the esophagus. The esophagus carries food to the stomach by coordinating the contractions of the muscular lining. This is an involuntary process that most people do not notice. Most people only notice the processes that occur in the esophagus when they swallow large amounts of food at once or drink extremely hot or cold liquids. This may be an uncomfortable feeling for most people as it feels a lot like choking. In cases like this, people often feel the movement of foods or liquids from the esophagus to the stomach. The esophagus contains muscles called sphincters. The main purpose of sphincters is to squeeze together the upper and lower ends of the esophagus. During the process of swallowing food, the sphincters relax so that food and liquids can freely pass from the mouth to the stomach without feeling any kind of discomfort. After food is swallowed, the sphincters close to prevent the food or liquids from leaking out of the stomach back to the esophagus and the mouth. The sphincters of the esophagus have a very important purpose, as this also allows people to eat or drink while lying down. When people emit gas, especially in the process of burping, the sphincters relax, making it possible for a little amount of food or liquid to come back up in the mouth. This is a completely normal process, albeit undesirable. The esophagus is a very important organ that aids in the normal functioning of the human body; however, some conditions such as cancer may require the removal of the esophagus. While inconvenient, a person can still function properly without an esophagus, provided that certain health measures are taken into practice.